At only 21 years old, Jacob Morris has proven himself as a natural entertainer. With over 175 performances in 2017, his on-stage presence shows to be raw and exciting. Performing all over the state of Arizona, throughout the southwest and in Nashville, people are starting to notice the impact of Jacob’s music. His first single “Storm” was an anthem for suicide awareness and was a partnership with the local non-profit, The Commit Campaign. The song was released independently and has been viewed over 40,000 times on Facebook. His latest single “Get Up” was recorded with Kenny Chesney’s band in Nashville and was released back in May of 2017. Arizona viewers have probably seen Jacob as a regular guest and performer on Channel 12 News. The news station helped him promote his Kickstarter campaign in which he raised over $10,000 for his latest recording project. They also featured him recently as the special artist at Country Thunder 2018. Recently, Jacob has been spent several months in the studio recording brand new original music with producer John Herrera. His studio band included the talents of renown and acclaimed musicians like Ray Herndon, Mel Brown, Mike Smith and many more. Though the exact release date of these new songs is TBD, his fans can expect to hear his new material very soon! With his youth to his advantage, Jacob is becoming known as one of the hardest working new artists out there. It’s only a matter of time before the world catches on to him. Music is the beautiful combination of structure and artistic expression. Singer songwriter Ben Anderson writes and performs with balance as his mantra. Anderson’s gift for strong melody, harmony, and lyrical content is consistent, even if his sound ventures into other styles of music. His bluesy, soulful voice is a rich blend of John Mayer, Sam Smith, and Jack Johnson. While his soft vocals caress you, but the music behind the caress delivers a satisfying jolt. Born in Phoenix, AZ, he fell under the seductive spell of songwriting at the age 14 when he picked up his first guitar. After graduating from Arizona State University with a bachelor’s degree in Kinesiology, Anderson decided to pursue a career as a singer songwriter. Award-winning songwriter Eric Ramsey is,among other things, a two-time champion of the Phoenix Blues Society’s Blues Showdown, a two-time featured artist at the Dripping Springs (TX) Songwriter Festival, Finalist of the Telluride (CO) Blues Challenge He has performed at International Blues Challenge in Memphis, TN. Eric is a past winner of the Stefan George Memorial (Tucson Folk Festival) Songwriting Competition, and has been tapped for the prestigious Songwriter’s Showcase produced by Tempe Center for the Arts, filmed for PBS distribution. Eric is a favorite on the Folk and Blues Festival circuits, not only for his dynamic performances but for his open tuning and slide guitar workshops. With soaring vocals and organic arrangements, Eric writes from experience about the human condition – at times sensitive, at times humorous, always thought-provoking. His arrangements and delivery encompass a spectrum of styles, from delicate fingerpicking to raucous, bluesy bottleneck slide. 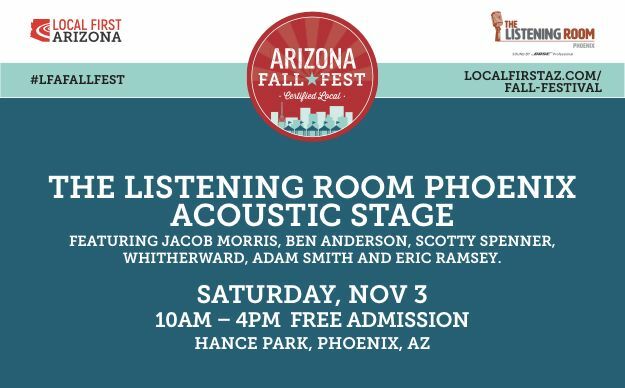 Founded in late 2016, The Listening Room Phoenix is brainchild of music industry veterans, Jim Colletti and Adam Smith. The Listening Room Phoenix was designed first-and-foremost with the performer in mind. Smith, an accomplished singer-songwriter and his manager, Colletti, dreamed of a space where everyone could enjoy pure, acoustic music that is free from the distractions of outside noise, clinking dishes, chatter, and other unwelcome sounds that often lessen the experience. With sound provided by Bose Professional, The Listening Room is acoustically balanced and technically sound, offering the perfect space for acoustic performance artists and the people who appreciate them. Unlike any music space in the Valley, the 50-seat audience actually becomes part of the experience. Each show is recorded before a studio audience, enabling musicians to have a professional demo of their work in a distraction-free, live performance setting. www.thelisteningroomphoenix.com.